130 km/h in France and Italy. That translates to 81 mph, which is not an option on the poll. The poll also doesn't have an option for "no speed limit", which at least two of us have experienced. This topic doesn't really need a poll, anyway. Just because you can do a poll doesn't mean you should. Just because you can do a poll post doesn't mean you should. TX-130, the 85 MPH bypass around Austin. 75 for me after finally hitting I-95 in its northern stretch in Maine last summer. Considering different classes of roads, I've been on the 85 mph toll road in Texas, 80 mph Interstates, 75 mph urban freeways, and 75 mph narrow two-lane roads. Regarding urban freeways, I-20 in Midland doesn't look urban, but it definitely has urban-level traffic, so I count it for this purpose. I found that the speed limit was too fast when a long line of cars backed up an exit onto the freeway and drivers were suddenly pulling onto the shoulder to get in line. That limit has been reduced to 65. I-20 in Abilene and the 183A, Loop 1, and SH 45N toll roads aren't exactly urban. I don't count the 75 mph managed lanes because they're managed so as not to act like urban freeways. I'd say the highest truly urban freeways I've been on are I-20 across Fort Worth and Arlington, and I-35W in south Fort Worth, with speed limits of 70. The northern section of TX-130 isn't even 85 mph. Maybe it was in a high security wildlife refugee? Now I'm imagining some deer with a Secret Service security detail. A refugee from the wildlife? or is the wildlife fleeing from something else? I'm confused. A refugee from security wildlife (aka security robots) who happens to be high (unclear whether it's due to elevation or if it's the other kind of high). Nah, a place with wildlife that's super sensitive to fast things. I really dunno, just looking for an explanation. 80 MPH. There's one less than 3 miles from my home And yeah I've driven on lots of 80 MPH roads. Nothing higher though. Besides the "higher number, not higher limit" of 110 km/h (68 MPH) in Alberta. I seen 75 personally here in Houston. I know west Texas hits up to 85. 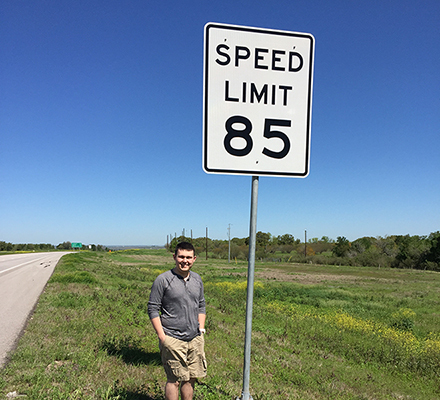 Actually, only one highway near Austin is at 85. West Texas (and the rest of the state, for that matter) maxes out at 80 mph. I've seen 70 MPH in PA as a passenger, but haven't driven any of the upgraded roadways since before they were upgraded. On non-freeways, the highest I've seen is 55. On 2-lane roads, the highest I've seen posted is 50, but there are grey areas where 55 is posted before the road drops to 2 lanes, and there is a significant distance until a lower posted limit appears (this happens on NJ 73 South where it drops to 2 lanes after the Atlantic City Expressway). Two-lane road—65 mph, although I’m pretty sure I recall Mexico 307 between Playa del Carmen and Tulum being a two-lane road posted at 110 km/h back in 2002. Street View shows it’s now four-lane divided and posted at 100. East of the Mississippi the highest I can recall on any two-lane road is 60 mph on various roads in Florida. I have never seen above 55 on a non freeway.